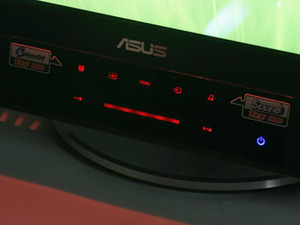 It’s fair to say that Asus has really delivered on the connectivity front, as it has included not only the standard PC connectors (i.e. VGA and DVI – the latter is of course HDCP compliant) but also a whole host of additional connectivity options too. Also there are Component video, S-Video and Composite connections, along with Left/Right audio connectors for both Composite and Component. There are also 3.5mm input jacks for headphone and microphone cables to your PC and a USB B-type connector. Here it’s worth elaborating on why there will be less cable mess as a result of having the headphone and microphone jacks on the side of your monitor – they’re a part of the VGA cable. This might seem a little strange because most end users are likely to connect this monitor to their PC via DVI, but even if you’re not using VGA, it’s two cables instead of three or four. 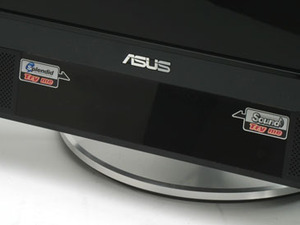 Of course, it would have made more sense for Asus to bundle the microphone/headphone and USB cables into the DVI, but unfortunately that hasn’t happened – we can only live in hope that Asus implements this into a future revision of the screen. I guess the only notable omission from this display’s array of connectivity options is HDMI, which is surprising considering it’s a gaming monitor and Sony’s PlayStation 3 has an HDMI connection. Of course, HDMI is not the only way to connect your PS3 to your display and even if you opt for Component, you can still connect your Xbox 360 to the VGA connector at the same time. After plugging the screen in, we started playing around with the touch-sensitive controls and oh what a bad idea that was. Every time I touched a button, the screen’s speakers emitted a horrible sound that not only disturbed the rest of the guys in the office, but it also took me a good few minutes to navigate my way through the OSD to turn them off! I honestly wish I hadn’t done what the garish stickers asked me to do. The touch-style buttons are quite a novel idea, but unfortunately they also have their flaws. On the positive side, I really like the colour scheme – the red buttons look great in the dark and when you first turn the screen on, it looks quite cool. In fact, I’d go so far as to say that the effect reminds me of Knight Rider – what a classic programme that was! Unfortunately though, as soon as you start to use it the flaws start to stand out. The first being that they’re incredibly susceptible to finger prints that frankly make the monitor look a little less appealing than it does when you first take it out of the box. Secondly, the buttons just don’t have that positive feel and you don’t know when you’ve pressed a button. I can’t say I’m a fan because for every time I think ‘this looks cool’ there is another time where I found myself cursing the touch sensitive buttons after I’d either touched it too many times, or it’d take more than a couple of attempts for my touches to be registered. 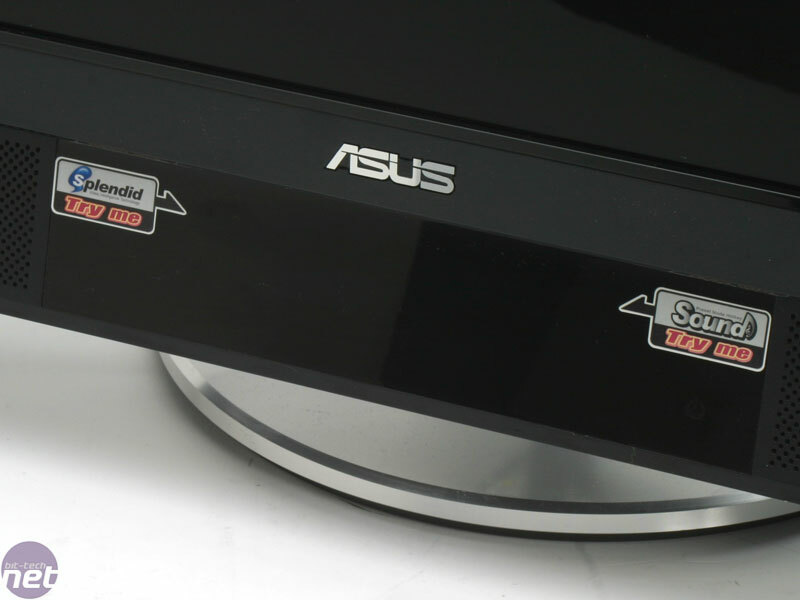 Potentially more annoying is the coloured bar underneath the lip in between the Asus logo and the touch-sensitive OSD buttons. This is lighted and changes between five different colours, depending on which sound mode you’re using. There are two ways to turn this off, but neither really jump out at you and it’s incredibly well hidden – you can either go through the menu to find the “light in motion” option under the settings tab, or you can use the “-/V” button. Curiously, there are five different settings for the lighting, depending on how bright you want the light to be. I can see the appeal, but we’d just prefer a simple “on/off” option. When the effect is on, I can’t help but be reminded of films like Fast and the Furious – let’s just hope it performs better than those movies, right? Many of the 24-inch widescreen monitors that have recently hit the market have used TN+Film panels to keep costs down. Hyundai has gone against the grain with its ImageQuest W241D, as it uses a PVA panel and looks good on paper - will it live up to its spec sheet?